Ready for a Halloween look that is a little less traditional? 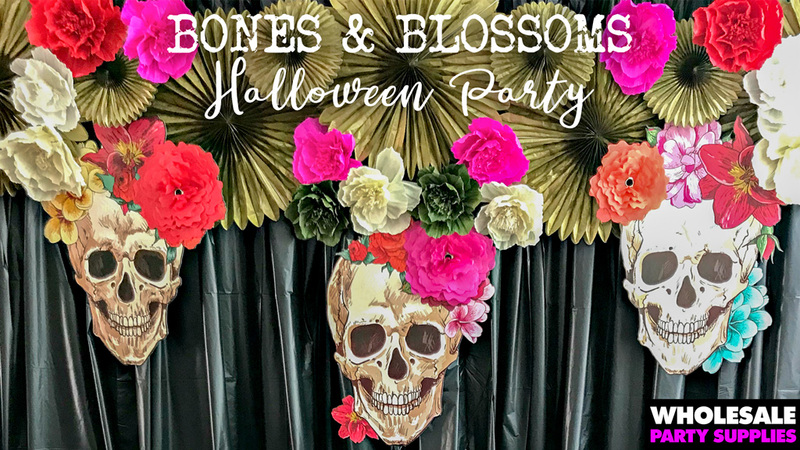 Grab your ghoul-friends and host a bootiful Bones and Blossoms luncheon. When traditional and orange and black just won’t do, try bright and cheerful flowers, with a side of skeleton twist. 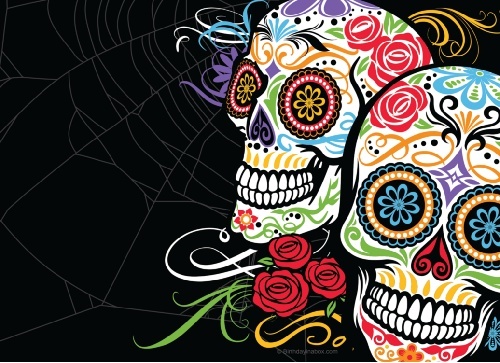 You don’t have to love the same old colors but you can still include that spooky spirit. 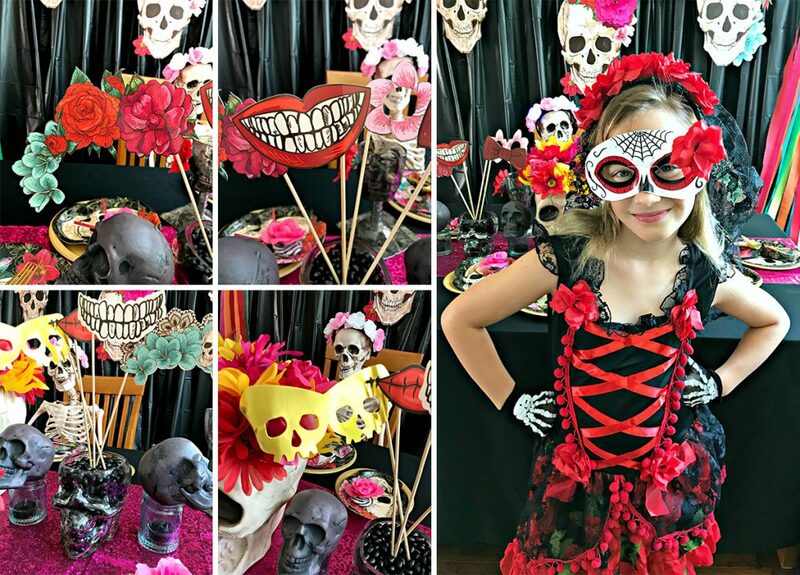 This party was styled and designed by Kylie from Made by a Princess. Head over to her blog for more party tips, recipes, and free printables. Need something a little different? A little unexpected? Personalize this spooky floral invitation (intended for Day of the Dead) is perfect for those that appreciate the pretty things in life with a side of darkness. Springtime parties shouldn’t have all the floral fun, right? 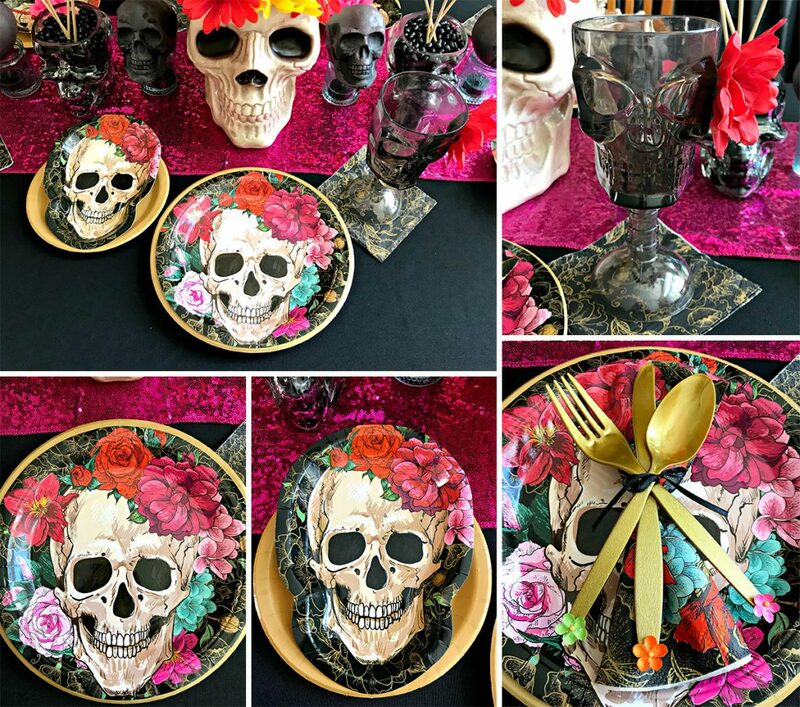 Let your guests know they are invited to a unique and feminine Halloween party like nothing they have ever seen before! 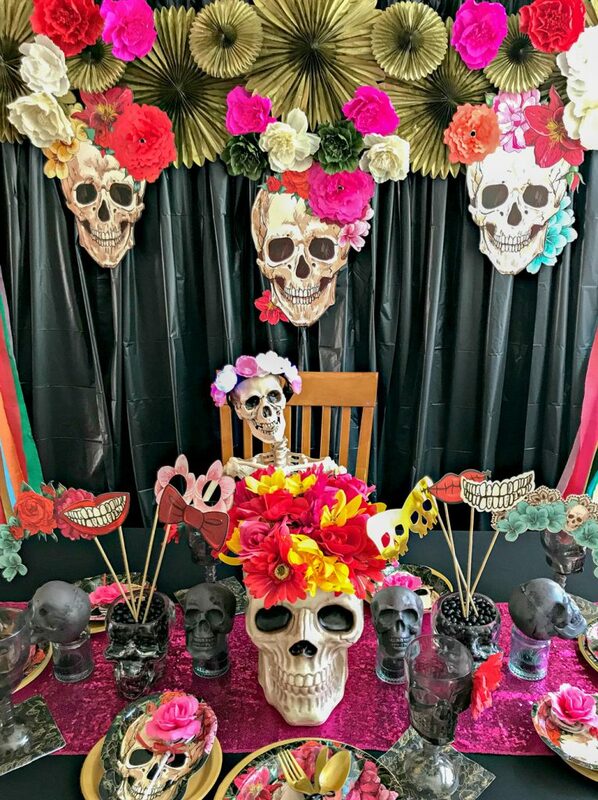 A simple black backdrop made with black plastic table covers is the perfect canvas for showing off the giant skull wall cutouts, gold paper pinwheels, and bright crepe paper blossoms. The gold pinwheels add a bit of elegance and the 3D flowers add a feminine touch. Who said a skull candy bowl is just for candy?! You can fill the candy bowl with silk flowers or you can opt to use fresh flowers in red, pink, yellow, and orange. Make sure to use floral wet foam bricks to keep your flowers upright and fresh. Aqua glass votives tie in the aqua flowers used throughout the design. These can be filled with candy, flowers, or tea lights. Simple glass skull bowls filled with black jelly beans serve a double purpose…treats for nibbling while chatting with friends and a vessel for photo props. Little touches go a long way. You can easily add mini paper flowers to utensils with a pack of blossoms from your local craft store and a glue gun. 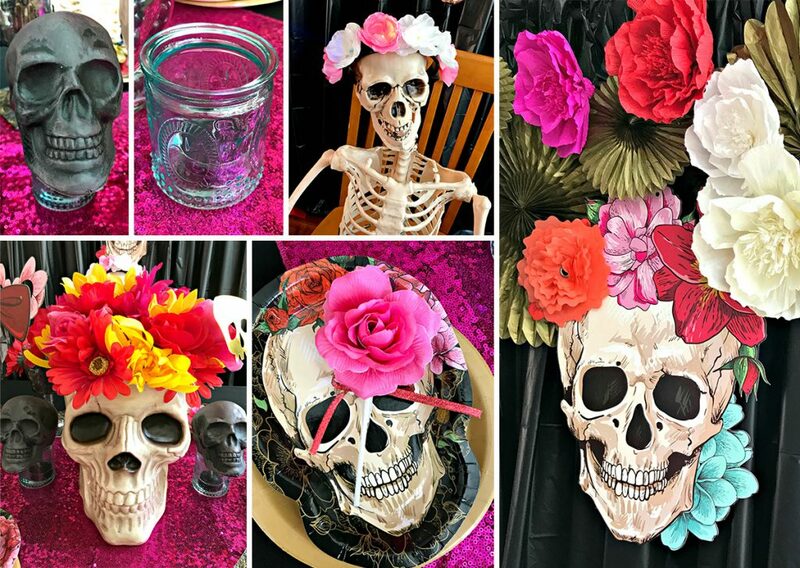 If you are feeling extra crafty hot glue a silk flower to plastic skull wine glasses. When the party is over just pull them off and reuse for another party. Name the Ghoul or Villain – Pin a piece of paper on each guest as they arrive. The guest then asks yes or no questions until they figure out who their ghoul or villain is. Halloween Movie Trivia – Create a Halloween movie trivia game and have your guests fill it out to test how much they know about spooky scary movies. Mad Lab – Fill bowls with things like noodles, skinned grapes, hard boil eggs, beef jerky mashed bananas, cooked baby carrots, and mini hot dogs and have guests close their eyes while they feel around the bowl. 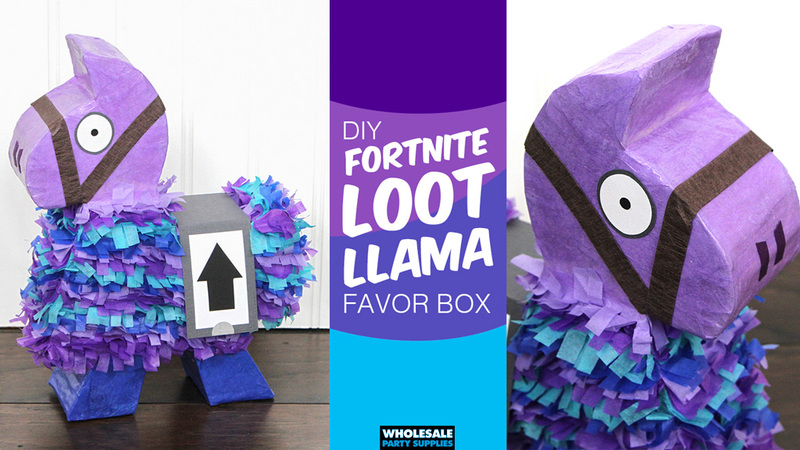 Sure to creep them out! 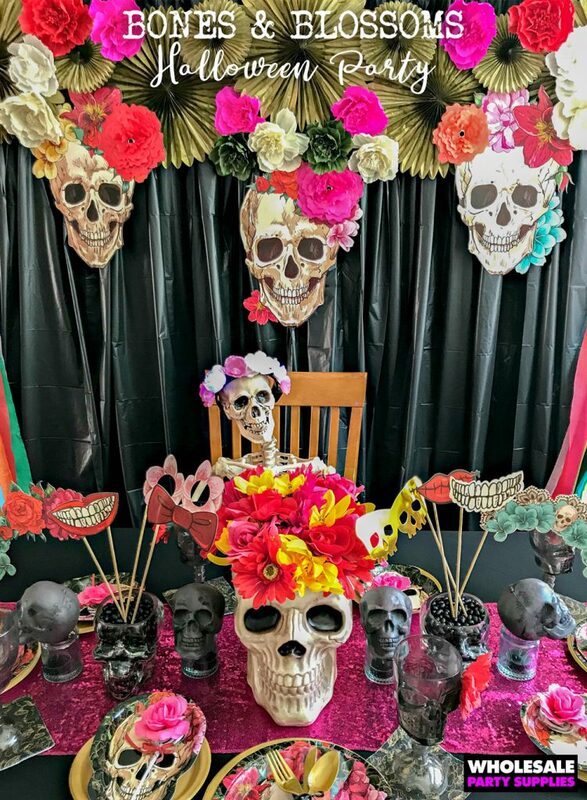 Spooky photo props will give even shy folks a reason to take a selfie! Bonus points for creating a gallery of memories of your Halloween bash. 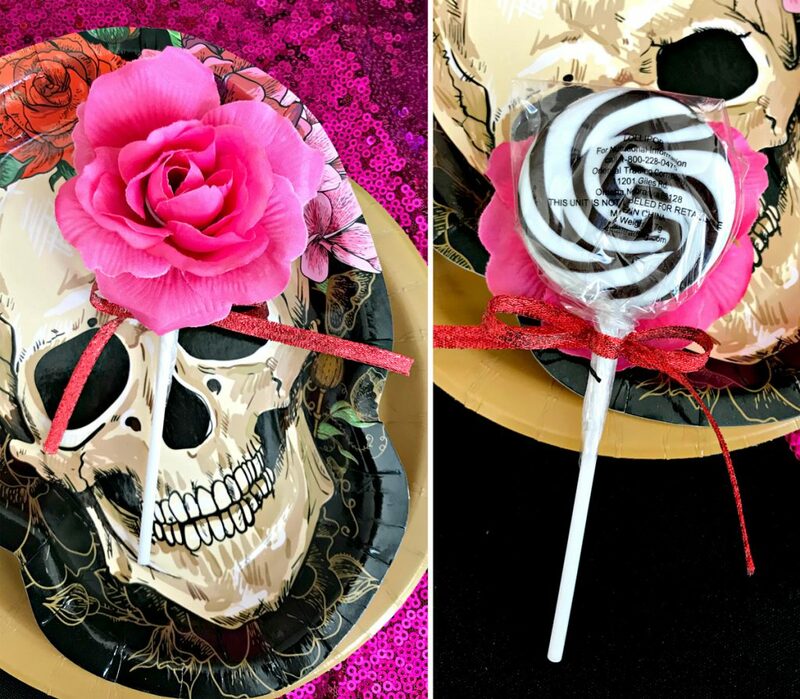 Send guests home with a black and white swirled lollipop topped with a silk flower to remember your fun and unique bones and blossoms party. Party styled and designed by Kylie from Made by a Princess. Head over to her blog for more party tips, recipes, and free printables.